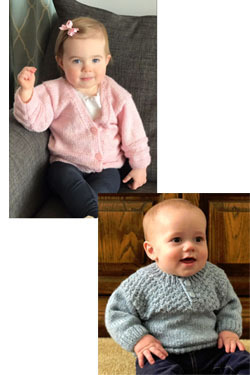 To Fit: 0-3 Months (6-9 months, 12 months). Approx. Finished Size: 18 (20, 22)”. Approx. Finished Length: 11 (12, 13)”. Approx. Finished Sleeve Length: 6 (6½, 7)”. Gauge: 20 sts = 4” on a US 7 needle over st st. Needles: US 5 & 7, or size to obtain given gauge, 24” circ. size 5 needle; safety pins, 3 buttons. Approx. Finished Length: 10 (11, 12)”. Natural Bebe: 2 (2,2) 100g ball. Shown in color 5406 Sky Blue. Needles: US 5 & 7, or size necessary to obtain given gauge, stitch holders, 2 buttons.